Old Riga is the oldest part of Riga which started to develop as a town already at the end of 12th century - beginning of 13th century. Initially, before the arrival of settlers from the Western Europe, here were located two - three villages of Livs, most likely near Old Riga there was also a hillfort of Vends. Initially Old Riga was nearly surrounded with water. Since the beginning of 13th century Riga developed as a centre or wider region. Due to location on important, ancient trade route - Daugava River - the town developed into international trade center. 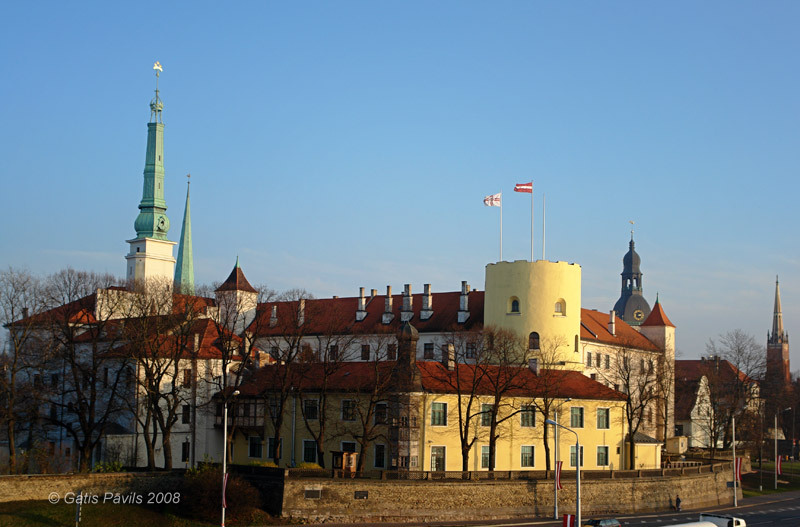 Riga became one of the most important members of the once influential Hanseatic league. Several times throughout the history the city has been very affluent and Rigans undertook construction of grandiose and luxuriant buildings. One should remember that Riga already in medieval times exceeded borders of Old Riga. Busy economical life nearly always took place in much larger area. Old Riga formed as a fortified masonry citadel, here were located buildings which testified the might and affluency of city. Meanwhile major part of Rigans for many centuries lived outside the walls of citadel - there were build wast wooden suburbs which during the war time were burned down or were dismantled. Thus those who are less informed might get an impression that medieval Riga was smaller than it was in reality. Meanwhile Old city has got another feature - contrary to many other medieval towns of Europe Old Riga still is a heart of the city, it is lively and very active, here still is ongoing active construction and major part of head offces of state institutions are here. Although Old Riga is medieval city, here in high quality are represented all styles of architecture - starting from Romanic style and up to the latest styles which will be named by future generations. Most outstanding value of Old Riga is the medieval city itself with its unrepeatable cultural landscape formed by ancient, narrow and winding street network with approximately 700 valuable buildings of all architectonic styles along them. Below the streets and buildings in while area of Old Riga there is cultural layer, which still is hiding surprises - for example, underground passages, remains of prehistoric settlements, or, for example, the mysterious megalith found in 2000 - stone head of Salaspils. The most valuable buildings most likely are the three grand churches from 13th century - Dome Cathedral, St. Peter's church and St.Jame's church (St. Jacob's church). There were times when these were some of the highest buildings in the world. Exceptionally valuable are also other churches from 13th century, for example St. Maria Magdalena Catholic church, St.George church from 1207 and St.John's church. In different times and places in Old City there ere built four fortified castles - but up to this day only one has been preserved - the newest Riga Order castle. This structure also has got prominent history and there are important cultural values preserved. Among other values should be mentioned also the House of Blackheads - this exceptionally ornate example of Gothic and Maneurism styles was destroyed in 2nd world War and rebuilt in 1999. Among other notable buildings could be mentioned Convent of Ecke anf all the complex of buildings in convent of Sacred Spirit and numerous other buildings. Prominent monuments of art are Mannerism and Barocco style reliefs and portals on numerous buildings. And in conclusion of this short list should be mentioned the numerous museums of art and history in Old city. Old Riga together with the Centre of Riga is included in the UNESCO World Heritage list since 1997. Table lists the described monuments of Vecriga. Grey colored monuments have not been preserved up to this day.